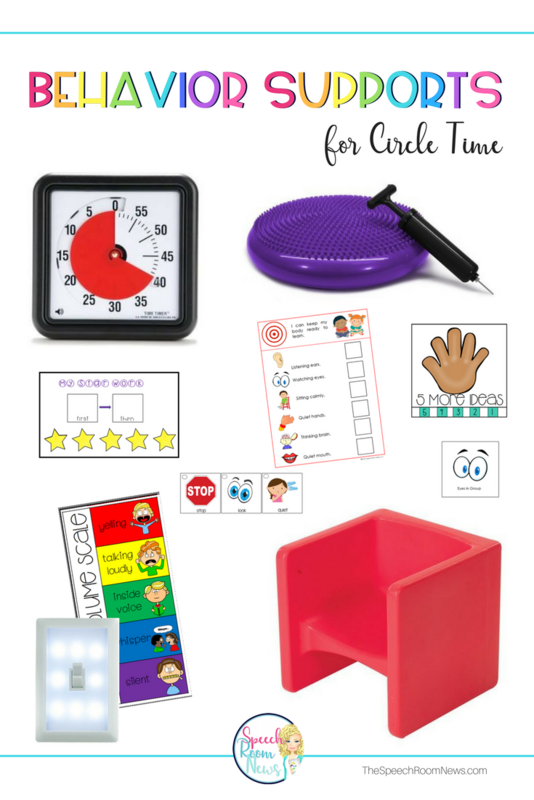 I spoke last week about some of my favorite strategies for behavior management of groups in speech and language circle time. I knew I needed a whole post to talk about some great other supports. One of the best things you can do is come prepared with behavior supports. Here’s a run down of my most-used behavior supports. I’ve included affiliate links within this post for your convenience! For students who have trouble with volume, I use a volume scale. Either post it on the wall and use as needed or let the child hold it in his hands. Then try to use non-verbal prompting to have them took at the scale. 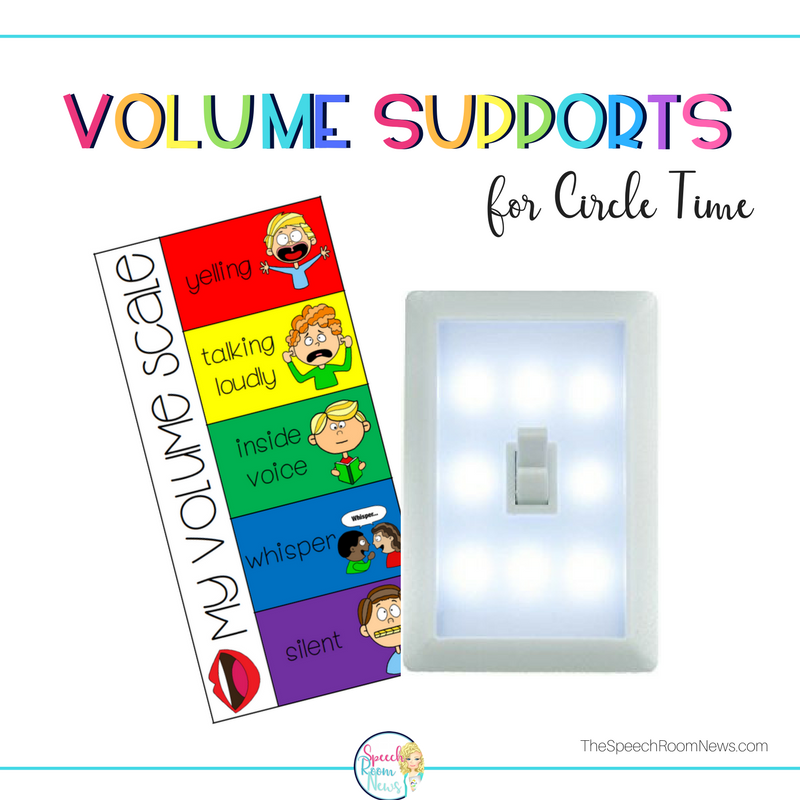 Another favorite for our “blurt club” is this dollar store light. You might know some friends in the blurt club. They have SO much to say but they don’t know how to catch a bubble until it’s their turn. If a thought pops into their minds, your going to hear about it. They sell these lights at the Dollar Tree and at 5 Below. I use the lights to prevent blurters! I introduced this idea to one of my teachers and she’s using for the second year with her class! Teach the class that when the light is on, it’s your turn to talk. When you turn the light off, that’s when it’s time for everyone to talk! This simple visual really works! If you get a blurting student, just gesture to the light instead of verbalizing and interrupting the group. 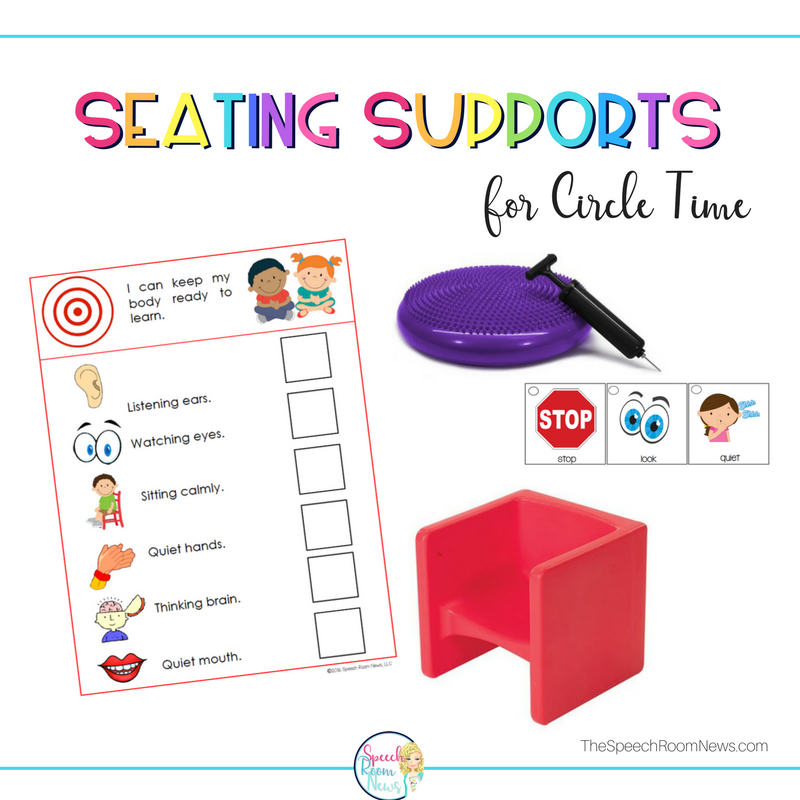 Seating supports are the foundation of a great group! I love carpet squares, wiggle seats, and cube chairs for different students. Some preschool friends really just need help knowing where their body is in space. 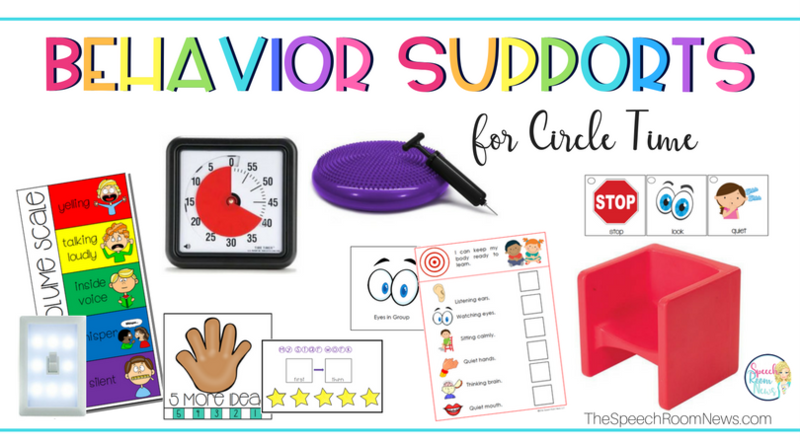 I use my behavior learning target chart to support expected behavior for each part of his/her body. I also use single images like stop, look and quiet on a single book ring so I can flip them and give to each student. Maintaining attention at circle time can be really hard for little bodies. If it’s especially hard for a student I’ll use a visual support. This can include an elapsed timer. I love this for our students who need to see how much time they have left at a task. It works great if you’re working on sitting for 5 minutes or so! Then take a break and have the student come back for another 5 minutes. 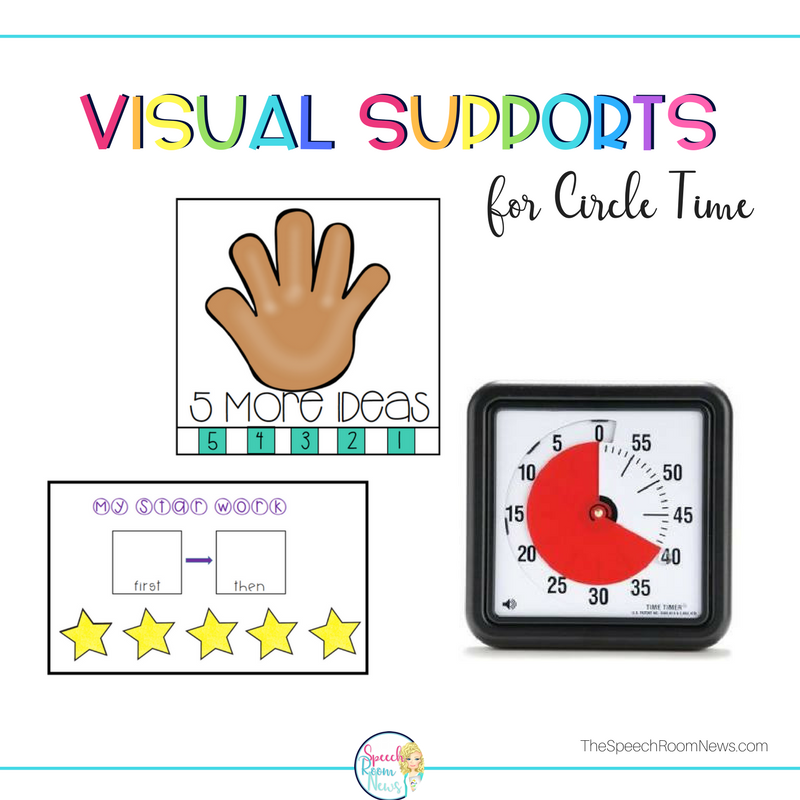 The 5 More Ideas countdown chart is one of my very favorite! I like to use the words “ideas” because my preschoolers can understand it more easily. This countdown gives them more support. I also use a first/then chart with 5 stars. Using these supports, don’t be afraid to give the stars quickly at first while your student is learning the process. Then you can space out the time needed for reinforcement. Can you tell me how you would use Hot Potato (not Mr. Potato Head) with articulation therapy?